How lovely to discover another 5-star review for A Penny for Your Thoughts on amazon this morning! My heart is smiling! This entry was posted in Award-Winning, Consideration for Others, Friendship, Love Poems, poetry, Review, Reviews, sherrill s. Cannon, Uncategorized, Valentine's Day on February 25, 2018 by Sherrill S. Cannon. Thank you so much for sending me a copy of your beautiful poetry. It reminded me of my lovely and my fiance’s grandmother. I cannot wait to share it with his grandmother, and it reminds me to maybe go visit my aunt and read to her memorial site one of these days. Sherrill Cannon’s poetry is beautiful, in the way that your grandmother’s voice sounded as she brushed your hair. I feel like I should be reading this book of poetry while sitting outside and breathing in morning air. I could see how lovely this book would be if read on a vacation in the countryside. This book reminds me of my aunt and her little kitchen with cute chair cushions and the nice decorations. Mrs. Cannon’s writing is melodic and soothing, like a cup of tea with your favorite relative would be. I love Mrs. Cannon’s personification and metaphors. She often personifies things in nature, how they behave, how they hold meaning to her. I feel that if I wrote poetry, it would be something like this. There are many favorite poems in this collection, so bear with me. I really enjoyed reading these. “A Promise”, “A Sign” History”, “I Think of You”, “Proposal”, “The Box”, “To a Holly Tree”, “Thorns”, “Winter’s Nuptials”, “Autumn”, “Brief Meeting”, “Frozen Wasteland”, “Grandfather Clock”, “Flowers”, “My Tree”, “Peter Pan”, “Ready”, “Separation”, “The Fork”, “When Death Comes For Me”, “Winter Arrives”, “Winter Bride”, “Winter Storm”, “Winter”, “A Year”. This entry was posted in Award-Winning, eBook, Friendship, Kalpart, Kindness, Love Poems, poetry, Review, Reviews, SBPRA, sherrill s. Cannon, Teens and YA, Uncategorized, Valentine's Day on February 21, 2018 by Sherrill S. Cannon. A MUST READ: STORIES AND EMOTIONS FLOW THROUGH EACH VERSE. In years past, poetry was written and enjoyed by many, today there is the idea, including among some professors, (who I have heard say, they don’t understand poetry.) That insinuates that a good or great poem is something that is indecipherable to most. I am not one of them, as with great poets, such as Maya Angelou, Robert Stevenson, Elizabeth Barrett Browning, there is a story in the poems, a sense of place and emotion flowing through the verses. 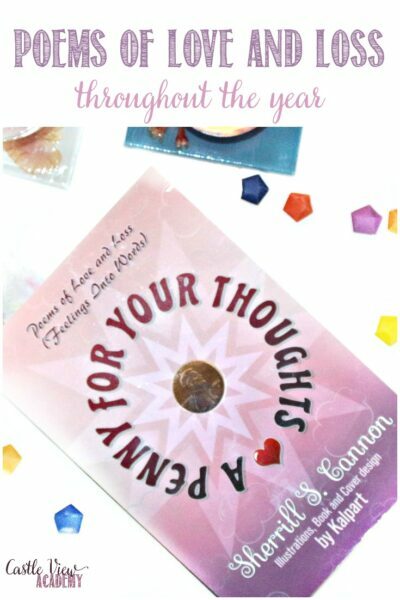 ‘A PENNY FOR YOUR THOUGHTS,’ by Sherrill S. Cannon is one such book. It is rich in emotion, stories flow through the verses, and tales of love and loss are ripe within its pages. It is a glorious book that should be savored from start to finish and this reader feels that one would have to be devoid of life experience not to find many in this book that do not strike a cord deep inside of them. Ms. Cannon’s poetry takes on the issues of grief, dying, being the object of idolatry, as, in her poem Pedestal, love, loss, and letting go. A magnificent journey through life. the tale of someone who is stuck upon a pedestal and cannot become truly human for fear of losing their love. ‘The Real Me,’ that speaks of the little part of oneself that is seldom if ever shown to anyone. ‘To See The Future,’ shows us all that we might lose if we could see the future. For we would no longer be living in the present, the joy, sorrow, love, grief, beauty, and glory of life would be forever shaded with the knowledge of what’s to come. ‘Does Memory Last,’ a question each of us may ponder, when we lose a loved one or are facing death. ‘Old Woman,’ is a poignant look at the young woman that exists in all, under the veil of wrinkles and aging. There were so many poems in this book that touched cords deeply within me, as to bring smiles to my lips, joy to my heart, thoughtfulness to my mind and grief inside of me. A PENNY FOR YOUR THOUGHTS is an astoundingly, wonderous trip through the thoughts, life, and emotions we all go through in life. In the pages of this book, everyone will find something that will help them grow or understand themselves better. I highly recommend it. This entry was posted in Award-Winning, eBook, Friendship, Love Poems, poetry, Review, Reviews, sherrill s. Cannon, Teens and YA, Uncategorized, Valentine's Day on February 20, 2018 by Sherrill S. Cannon. 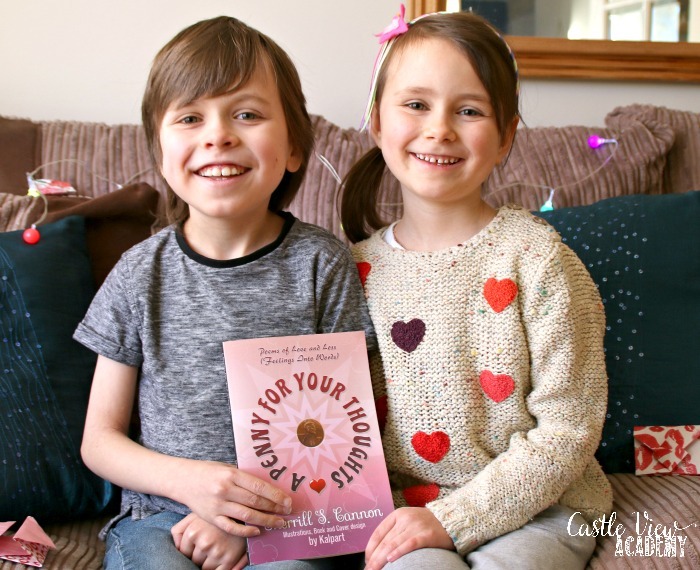 My children’s favourite picture book author, Sherrill S. Cannon has just published a ‘grown up’ book of poems called, A Penny For Your Thoughts: Poems of Love and Loss (Feelings Into Words) and I am pleased to be sharing it with you on Valentine’s Day (which also happens to be Sherrill’s birthday – Happy Birthday!!). However, I assure you this book is a good read year-round as well! If you have read any of Sherrill’s children’s books, you will know that she has the stereotypical rhyming of poetry down pat. But of course, poems for grown ups do not always contain rhymes and rhythms; however, they have other ways of adding interest and fun when appropriate! I do enjoy poetry, however I am not the biggest connoisseur, but even I recognised the haiku (my nephew’s favourite), and you’ll also find free verse, blank verse, sonnets, plays on words, and there are some fun poems that are created like little works of art with the words travelling up and down the page. There’s lots of variety of style for every taste. Sherrill spent many years teaching children and used poetry as way to help counsel teens through tough times. Poetry can give rise to new feelings and perspectives and has a way of going deeper into your thoughts while still being able to keep them shrouded behind a curtain of language and nuances that may not be visible to everyone. Poetry is a very personal way of writing and different people can read different meanings into it depending upon their own circumstances. This is one of the things I happen to love about it (although my teachers often disagreed with my own interpretations as they didn’t align with the scholars). But now that I’m not being graded on my answers, I like it even more! Tristan has always been drawn to poetry, even having his very first poem published, so he was interested in reading Sherrill’s poems as well. The first section is much lighter and cheerful in scope than the following two sections which become more dark and sombre as she moves from the joys of new love to heartbreak, death, and destruction. Currently I’m preferring the more upbeat poems such as I Think of You, Philosophy, and Thorns. On the flip side, I can also relate to All That’s Left and Existence. I have not read all of the poems in their entirety yet…as easy as it would be to sit down and read them at once, I’m taking my time to read one or three now and then. Sometimes making a point to sit and relax and take my time and clear my head. At other times this book may catch my eye as I pass by and I’ll pick it up, open it at random and have a quick read to mix up my day and take my mind off the constant movement and responsibilities, if even just for a moment or two. Poetry is something that enables you to do this. I have already consumed about three quarters of this book and some poems I have returned to more than once. There are a couple of sub-themes running throughout this book on the lines of the seasons, family, memories, rebirth, growth, and nature. Personally, I’m the most drawn to the poems where nature features. The crocuses (croci?) are now pushing up through the earth here and remind me each year of Tristan’s early arrival. They also have special meaning to Sherrill as well as they make several appearances. I’m not sure if all of the poems are drawn upon Sherrill’s own love experiences, past and present, or if she’s also drawn from the lives of her children and grandchildren as they grow; or if for some she is compassionately thinking of how others will feel in particular circumstances. Of course, a wordsmith will never reveal their secrets…and it is none of the reader’s business as we are drawn to the words and impose our own lives and emotions onto them. I am going to admit that I am not gifted with words when it comes to revealing my emotions; so today Phil will find one of Sherrill’s poems inside his hand-made Valentine’s card. And coincidentally, we’ve just received a book about how to write your own haiku and the children will be reading a few of Sherrill’s poems as examples. 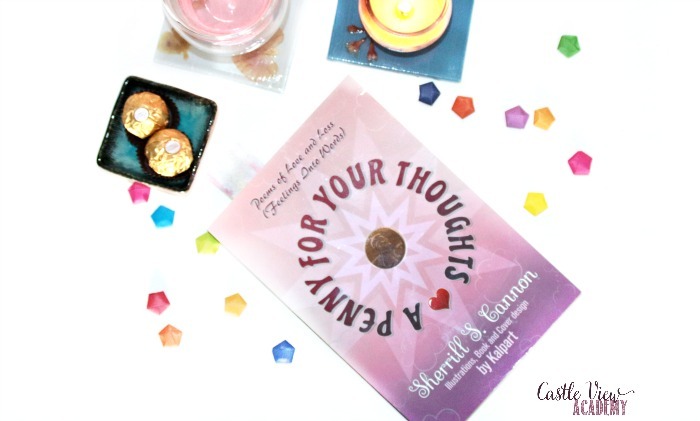 So from education, love, and relaxation, A Penny For Your Thoughts is a book for anyone who appreciates love and romance (or the pain of loss). If you like what you see, you can find out more about Sherrill on her webpage, or follow her on Facebook or Twitter. 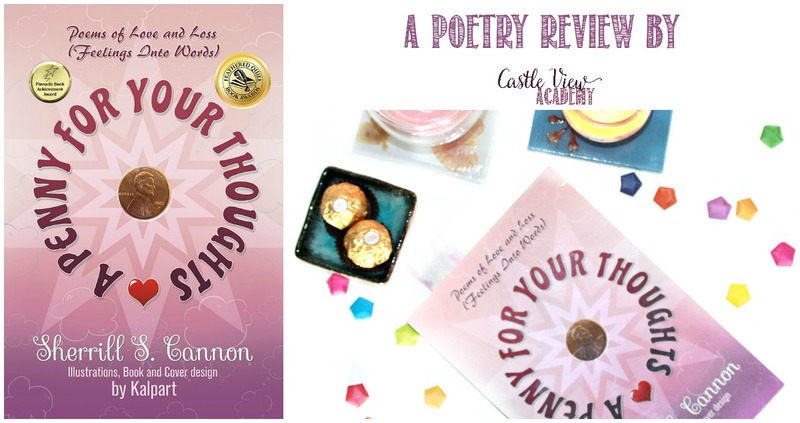 A Penny For Your Thoughts is available on Amazon. This entry was posted in Award-Winning, Friendship, Kid Fans, Love Poems, poetry, Review, Reviews, sherrill s. Cannon, Uncategorized, Valentine's Day on February 15, 2018 by Sherrill S. Cannon. Happy Almost Valentine’s Day… Books make Great Gifts! This entry was posted in Angel, Award-Winning, Children's Picturebook, Consideration for Others, eBook, Friendship, Guardian Angel, Kalpart Illustrations, Love Poems, Manners, Picture Book, poetry, Pre-School, sherrill s. Cannon, Teens and YA, Valentine's Day on February 13, 2018 by Sherrill S. Cannon. Happy Valentine’s Day to all…from a Valentine! This entry was posted in Award-Winning, Consideration for Others, eBook, Friendship, Love Poems, poetry, Review, Reviews, sherrill s. Cannon, Uncategorized, Valentine's Day on February 10, 2018 by Sherrill S. Cannon. This entry was posted in Angel, Award-Winning, Behavior, Children's Picturebook, Consideration for Others, eBook, Guardian Angel, Kalpart Illustrations, Manners, Picture Book, Pre-School, Review, Reviews, SBPRA, sherrill s. Cannon, Uncategorized on February 8, 2018 by Sherrill S. Cannon.